Shannon Pitcher was trying to forget the brutal murder of her ex-husband and the loss of her only daughter, when fate brought her to a lost, scared little girl named Charity at the gate of an abandoned and haunted place called Feral Park. Now she must save Charity from the same Bogey Man who killed her own daughter, and from the wild children of Feral Park. Gordon Chambers has searched for six years for his daughter. Even when his estranged wife is found slaughtered and his daughter, Charity, disappears, hope remains in the form of strange dreams. Gordon follows a trail that leads him to the small city of Riverside, Washington, and Shannon Pitcher. After years of living as prisoner of the fairytale monster that killed her mother, Charity has escaped. But the Bogey Man wants her back, and he will not stop until he has her. There is only one safe place for her now, but the price of safety will be more than her innocence; it will be her soul. The key to her escape may be the very thing that makes her so special to the supernatural killer. 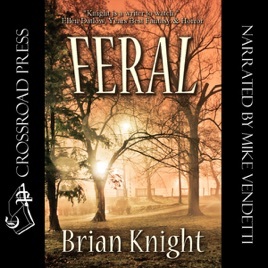 Feral is a tale of love, loss, and childhood fears come back to life.